Sylvia Anderson is recognized for 35 years of service. She stands with Iowa State University President Wendy Wintersteen and ABE Department Chair, Steve Mickelson. 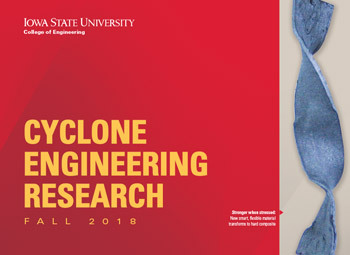 In early March, two leaders of the Department of Agricultural and Biosystems Engineering (ABE) were celebrated at the annual Iowa State University 25 Year Club Banquet. 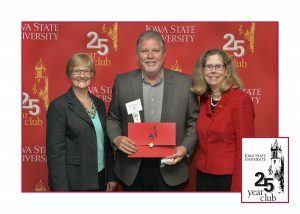 Dr. Steve Mickelson, ABE Department Chair, and Sylvia Anderson, program assistant, were recognized for their 35 years of service to Iowa State. 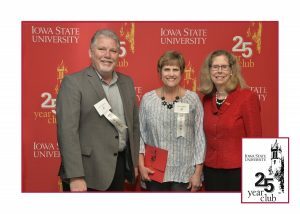 Mickelson and Anderson were recognized alongside 41 other Iowa State University Employees who have served 35 years. Anderson has served as the program assistant in the Department of Agricultural and Biosystems Engineering for 14 years. Previously, she served in the following offices: Iowa Crop Improvement, Financial Aid, Occupational Safety, and Industrial Education and Technology. Mickelson has been the department chair of ABE since 2011. He has served as the Director of the Center for Excellence in Learning and Teaching (CELT), Co-Director of Learning Communities, and Associate Chair of ABE. In 1984, Mickelson became an assistant professor in Freshman Engineering. He became an assistant professor in ABE in 1992, associate professor in 1998, and full professor in 2009. Steve Mickelson is recognized for 35 years of service. He stands with Iowa State University President, Wendy Wintersteen, and Dean of the College of Engineering, Sarah Rajala. 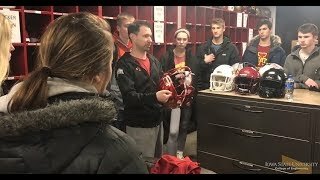 He earned his bachelor’s, master’s, and doctorate in agricultural engineering from Iowa State. The 25 Year Club of Iowa State University was informally founded in1915 when members of the staff who had served at least 25 years were honored at convocation. 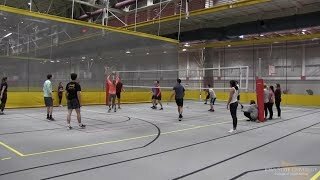 The organization was formalized in 1934 under the direction of the late Harold E. Pride, former Secretary of the Iowa State College Alumni Association. The Club charter was signed on June 9, 1934 by 43 members of the ISU staff. The purpose of the 25 Year Club is to honor the loyal service of Iowa State faculty and staff.